Walmart is bringing back its famous Smiley face icon after a 10-year hiatus and lengthy legal battle. "We felt like it was time to bring back an old friend, and one of the most-recognized symbols of low price ... Smiley," said Walmart Chief Marketing Officer Tony Rogers in a blog post. Smiley -- a minimalist image of the classic yellow smiley face -- was used by Walmart (WMT)from 1990 to 2006 to alert shoppers to deals. The character had grown increasingly ubiquitous and complex over the years, sometimes sporting a hard hat, a bow tie, and Robin Hood and Zorro costumes. But in 2006, Smiley faded away. "He didn't fit in with our advertising at the time. 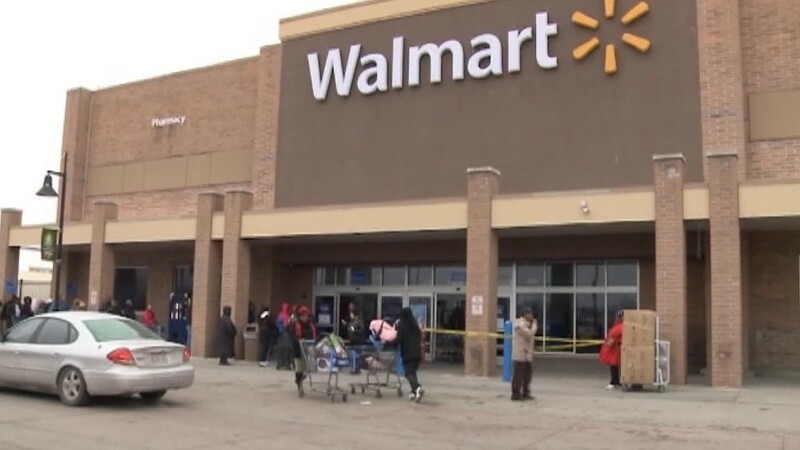 We were taking a different approach," Walmart spokeswoman Danit Marquardt told CNNMoney. "He has been used intermittently, but he hasn't been an active part of our advertising." Smiley was also involved in a trademark war with a Belgian designer named Franklin Loufrani, president of The Smiley Company in Brussels, which bills itself as "the original Smiley brand." Loufrani claims to have created the Smiley design in 1972, and has registered it in more than 100 countries. Smiley served as a discount mascot for Walmart from 1990 to 2006, then disappeared in the midst of a trademark battle. But now it's back. But Loufrani ran into opposition in the U.S. He filed a trademark application for Smiley in 1997 and put it on clothes, stationary, mugs, bags and plush toys. Several years later, in 2001, Walmart opposed the registration, "claiming a likelihood of confusion between Mr. Loufrani's Smiley and design mark and Walmart's mark," according to court documents. Loufrani fought with Walmart for years, but the Trademark Trial and Appeal Board eventually sided with Walmart. So Loufrani sued Walmart in federal court in Illinois in 2009, claiming that his own Smiley face was "readily distinguishable" from Walmart's. The case was closed in 2011 as Walmart and Loufrani were working on a settlement. But details of the settlement were never disclosed. When asked about the case, Marquardt said simply, "We own the trademark for Smiley." Emmanuel Orenga, a lawyer for The Smiley Company, said they signed a settlement in 2011. "Terms are confidential but Walmart is authorized to use their logo for these new advertising campaigns," he said. 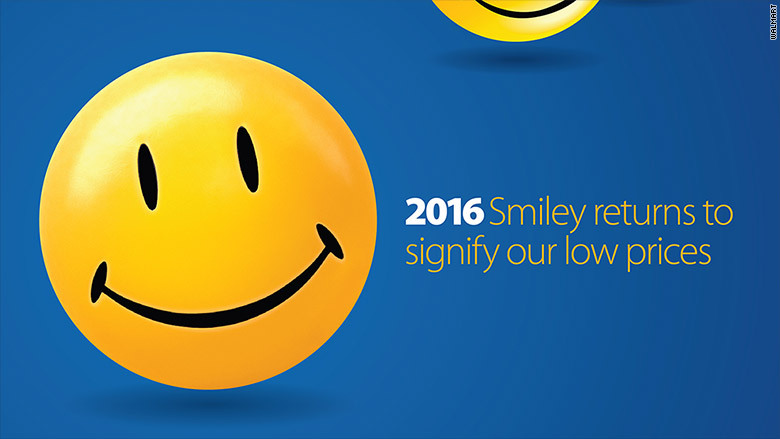 During the long hiatus, Smiley stayed alive in the minds of consumers, according to Walmart. "Nearly 70% of our customers still associate Smiley with savings at Walmart even though he's been behind the scenes for the past decade," said Walmart's Rogers in the blog. Marquardt said Smiley has returned to a "starring role in our advertising." Smiley is now a prominent presence on Walmart's Twitter page and company web site, in the section titled, "Summer savings that will make you smile." Smiley signs are also starting to appear in some stores, said Marquardt. According to Smithsonian Magazine, the original Smiley face was probably created by a graphic artist and ad man named Harvey Ross Ball in Worcester, Massachusetts, in 1963 to raise morale for employees at an insurance company. "Ball finished the design in less than 10 minutes and was paid $45 for this work," reported Smithsonian, but he didn't bother to trademark it.